Learn how to care for your fence throughout winter. The weather is getting colder, so you know what that means: winter is coming. With colder temperatures and extreme weather, winter can really do some damage when it comes to household and property maintenance. Winter is a difficult time for almost all exterior features of your home and property, including your residential fence. Melting and freezing ice and snow can do some serious damage to even an iron fence. There are a number of precautions and steps you can take to prevent further winter damage to your fence to make sure it is strong and functional come springtime. The most important thing you can do for your fence this winter is to properly landscape around it. If there are trees nearby, be sure to cut back any overhanging limbs before it snows. This way, if there is a heavy snowfall or ice storm, the branches are not there to get heavy and potentially fall and damage your fence. If you trim the branches back in time, you can avoid these problems entirely. Another important landscaping tip is to be sure that leave do not pile up around your fence. Do not brush leftover fallen leaves to the edge of your yard where your fence sits. If the leaf piles are left during freezing weather, they could damage your fence. Leaves lock in moisture, which can lead to water damage, warping, or rust on your fence. Leaves can also serve as shelter to unwanted pests, which is another reason they should be taken care of. During the winter if a pile of snow forms around your fence, use a rake or shovel to move it away. It may seem like a little extra work, but removing snow drifts from your fence will allow the snow to melt evenly when it gets warmer so that your fence can properly dry out. If you notice any large or even small damages to your fence, be sure to fix them as quickly as possible. If the posts are weakened even a tiny bit, they may not be able to properly handle the shrinking and expansion that comes along with freezing and melting snow. Take care to make any needed repairs as soon as possible. 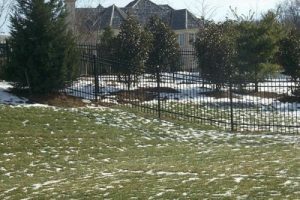 Whether you are ready to face the coming winter of your still have some questions about winter fence maintenance, Hercules Fence is here to help. Our people have years of experienced and are interested in helping you! We have plenty of experience with every type of residential and commercial fencing material including wood, aluminum, chain link, steel, and vinyl. We have fair and competitive prices and have offices in Manassas, Richmond, Newport News, Norfolk, Maryland, and North Carolina. Call us today at 757-316-3600 or visit us online at FencesNewportNews.com today for a free quote. This entry was posted on Friday, October 12th, 2018 at 11:03 am. Both comments and pings are currently closed.